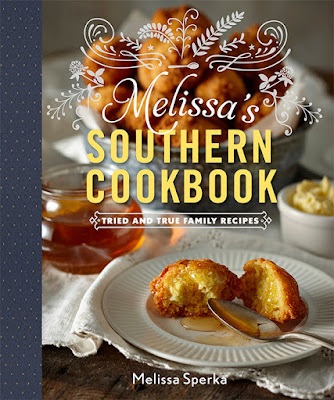 I can't even begin to tell you how thrilled I was when I was invited to review this awesome cookbook by my friend, Melissa, of Melissa's Southern Style Kitchen. 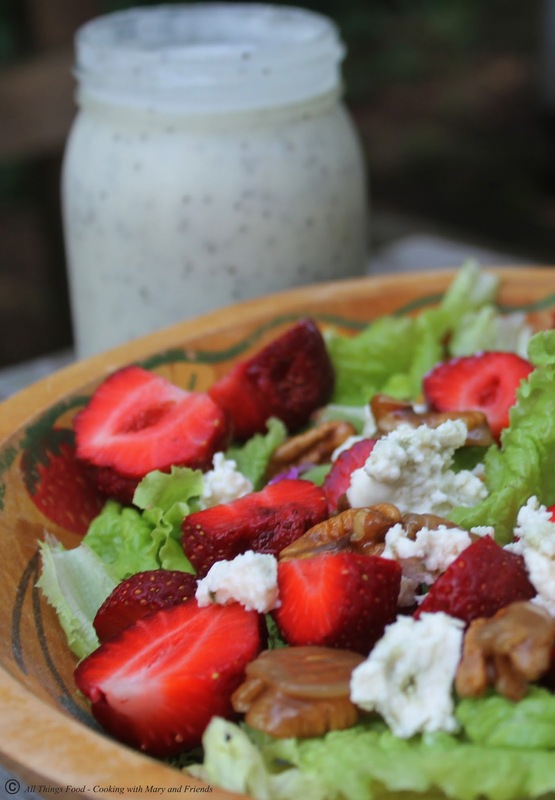 She was one of the first bloggers to like my page when I began my own blog, and over the past few years has shared many of my recipes with her readers. As Melissa says "I come from a long line of fabulous Southern cooks, and like most people, my culinary training took place at the side of my Mom and Grandmothers. Over the years, cooking has become a true creative outlet and passion. I truly enjoy the creative process of developing new dishes, and re-inventing Southern favorites. 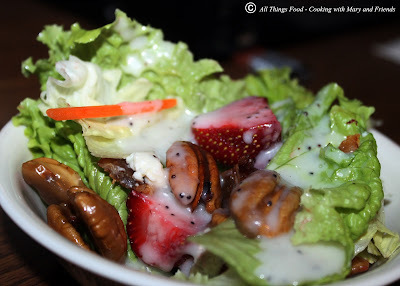 I also enjoy finding ways of making International dishes and flavors accessible to the home cook. 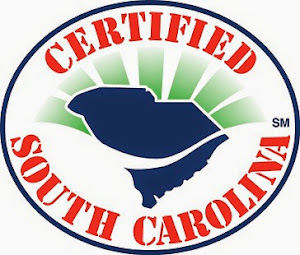 I’ve traveled quite a bit, and I lived overseas for several years, so, my International inspiration comes from those avenues and at times you’ll see my Southern Kitchen go global!" Better yet, she and I are almost neighbors! She is in North Carolina and I am just down the road in South Carolina. We have many things in common, but first and foremost is our love of cooking and sharing with friends and family. But let's get to this fabulous recipe now! STRAWBERRY SALAD WITH BACON, BLEU CHEESE & CANDIED PECANS ... oh my goodness! When I received my advance copy of her cookbook, "Melissa’s Southern Cookbook: Tried and True Family Recipes" I just knew this was the recipe I'd be making since I had some just picked sweet farm fresh strawberries from Willard Farms in my refrigerator PLUS I had my mom's vintage wooden salad bowl with the hand-painted strawberries on it to serve the salad in = perfect! To make the candied pecans, melt butter in a large pan or skillet. Add the brown sugar, corn syrup (or honey) and salt. 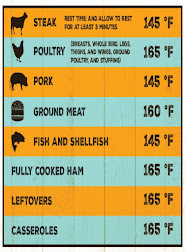 Bring to a simmer and cook stirring constantly 2 minutes. Lower heat to medium; add the pecan halves and cook for an additional minute or two, or until the pecans are evenly coated. Remove from heat and spread on parchment paper to cook, then break apart. 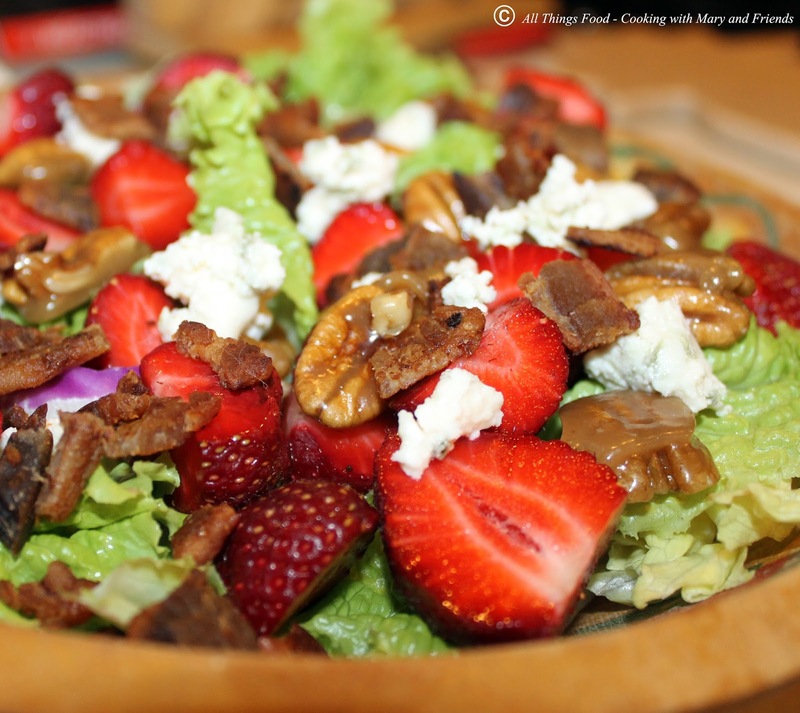 To make the salad: layer the greens, strawberry halves, bacon crumbles, bleu cheese and candied pecans and candied pecans in a large salad bowl and chill. Serve drizzled with the Poppy Seed Vinaigrette. 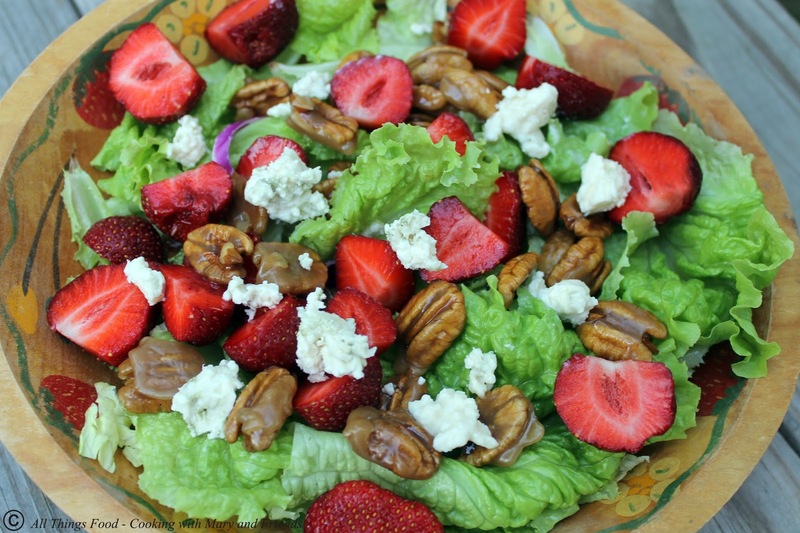 To make this as an impressive dinner entree salad, top with grilled chicken, steak or shrimp. 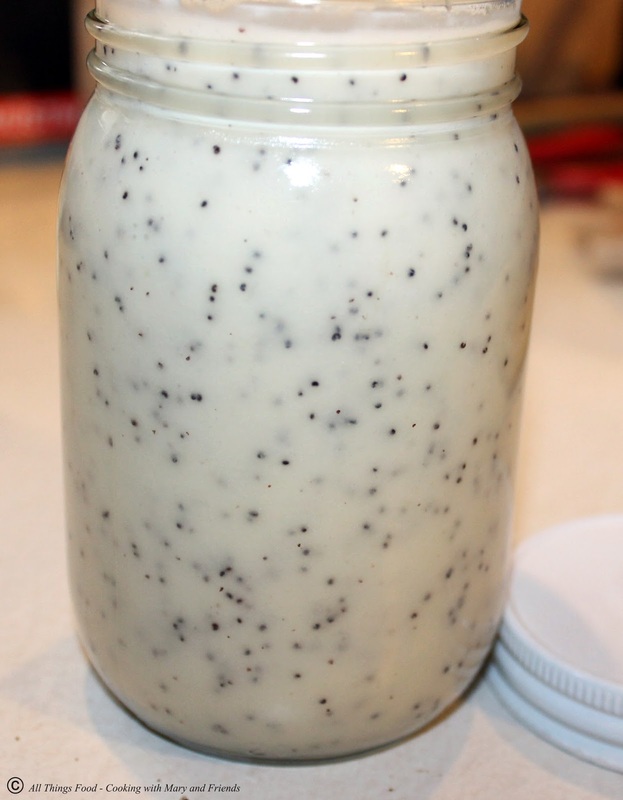 Combine the vinegar, sugar, shallot or onion, mustard and salt in a blender; puree for 20-30 seconds or until smooth. Remove the lid, reduce the speed of the blender to low and add the poppy seeds. Slowly drizzle in the oil and continue to blend until the dressing emulsifies and thickens. Chill until serving.